Recently I ordered a “Hello Fresh” box and I loved it! Hello Fresh is a company which provides meal-boxes. You get a big box with ingredients and recipes for 3 or 5 days. The recipes are varied, well balanced and very tasty! All recipes take about 30 minutes to prepare, perfect when you come home late from work. 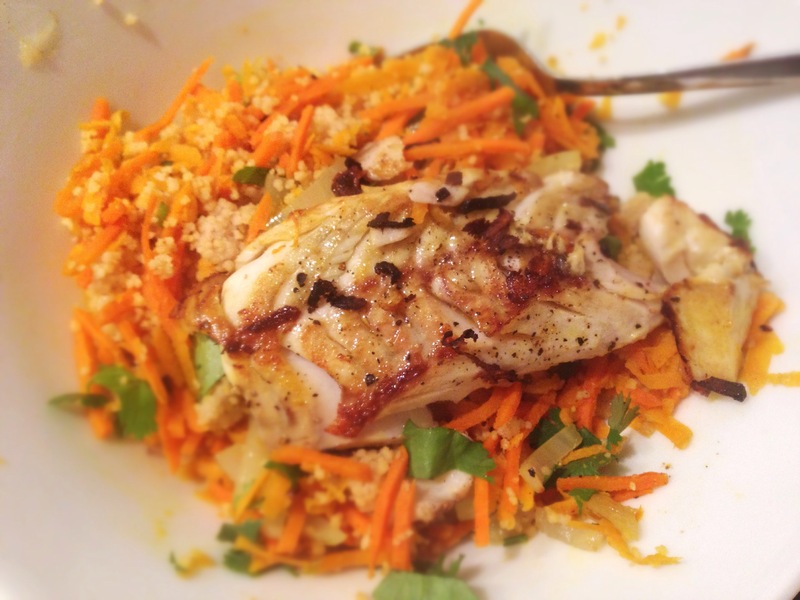 This herby couscous was one of my favorites out of my first Hello Fresh box. Chop the onion, crush the garlic, peel the sweet potato and grate it, grate the carrots. Chop the coriander. Prepare the vegetable stock and mix the couscous with the stock in a pot with lid and let it soak for about 10 minutes. Heat a little oil in a frying pan and fry the onion and garlic for 2 minutes. Add the grated sweet potato and carrot, the curcuma and the cuminpowder. Fry for about 6 minutes. Add salt and pepper to taste. The couscous absorbed the stock, loosen it with a fork. Add the sweet potato and carrot mixture, cover with a lid to keep it warm. Heat a little oil in the frying pan and fry the whitefish about 3 minutes on each side. Add salt and pepper to taste. Posted in Diner, recipesTagged couscous, diner, dinner, fish, fit, food, healthy, herbs, recipe, vegetable, veggieBookmark the permalink. Hmmm! Was het ook lekker? Lekker weinig ingrediënten! Deze heb ik ook gemaakt van Hello Fresh een tijdje terug, echt goed! Ik vond m ook echt een succes inderdaad!